Why did God let a madman shoot up a school? Better yet, why did He let Adam sin? Better yet, why did He let Satan into the garden? Better yet, why did He let evil into Satan’s heart? Why is there evil at all? Sure it’s true that God Himself through Jesus Christ came to rescue sinners from evil and to redeem the world. But why should the world and the people in it need rescuing in the first place? Is God like a man who built a house, rented it out to tenants and then set it on fire so that He could later rescue them? And even if we say that, in God’s case, He did not actively set the house on fire, He just allowed it to happen, He is still the one that had the power to stop it and chose not to. Why? Some say God did not stop evil because He could not; others say He did not stop evil because He chose not to. Among those who say He chose not to stop evil, there are those who say it is because God is evil, and then there are others who say it is because God wants to work good from the evil. In either case, God still appears evil. Because even a God who allows the ends to justify the means appears to be a God who is simply a manipulator of creation, like someone just doing the best He can with what He has to work with. But the God of the Bible is none of these things. So why then did YHWH allow evil into the world? Imagine evil never existed. Imagine Adam and Eve never sinned. And not only did they never sin they never had the option to sin, because evil was nowhere in existence. What then could we know of God? We could know His power. We could know His intelligence. But we could never know His Grace. Grace–unmerited favor–cannot be known in a world without evil. Grace does not exist in a perfect world because in a perfect world everything is merited. Every reward is the natural consequence of the perfect action that preceded it. But in a world where there is evil, there are many actions that merit condemnation, judgment, and even wrath. And in that world there is now space for Grace. In an evil world there is now an open place for favor to be poured out where it should not be. In an evil world Grace shines brightly against the just consequence of condemnation. Grace…an unknowable quality of God in a world without evil. Could it be that the great I AM is interested in displaying all of who He IS? In Grace we see a characteristic of God that is wholly unlike any other conceived divine being. In Grace we see the holiness of God (His otherness). In Grace we see the beauty of God. In Grace we see the love of God in a way that otherwise would not be possible. 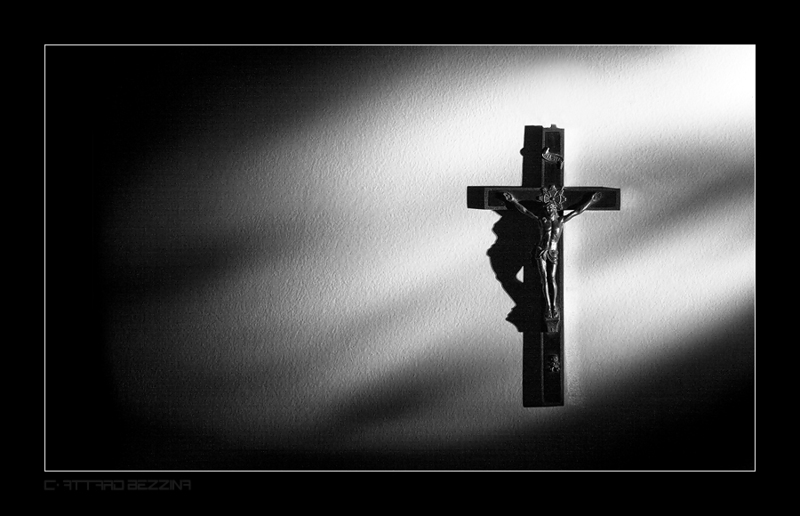 The Cross, the great symbol of Grace, is not just about salvation from evil, nor is it just about Jesus conquering evil. It is even more: it is a glorious beacon brightly shining in the darkness of night, displaying who God IS. Evil is necessary for Grace. Grace is an essential attribute of God. God desires to fully display His attributes. Therefore evil exists. ← Why pursue Jesus now? Thank you Alan. I never thought of things in quite this way–I will be sharing this with my family. Robin- thanks for the comment, I’m happy to hear the post was helpful.